Visible: If a legend is not relevant to your chart you can set this false to hide the legend. Appearance: This property controls the visual style of the legend as a whole including Dimensions, Position, FillStyle, ItemAppearance, ItemMarkerAppearance, ItemTextAppearance, RotationAngle and Shadow. Items: A collection containing the individual legend text and symbols for each series.Add to this collection to create your own custom legends. Marker: A visual marker for the legend as a whole. Use the marker Appearance property to control properties like FillStyle, Dimensions and Position. To assign an image to the marker use the marker Appearance.FillStyle property to set FillType to Image and FillSettings.BackgroundImage to the path of the image. TextBlock: Use TextBlock to control the default text and appearance. Use the legend Appearance ItemTextAppearance property to tailor the look of all legend item text at one time and the ItemMarkerAppearance to format all of the legend markers.Particularly note the CompositionType property that handles the display order of text vs. images where valid values are ColumnImageText, ColumnTextImage, RowImageText (the default) and RowTextImage. "Column" values show the text and image one above the other. "Row" shows text and image side-by-side. 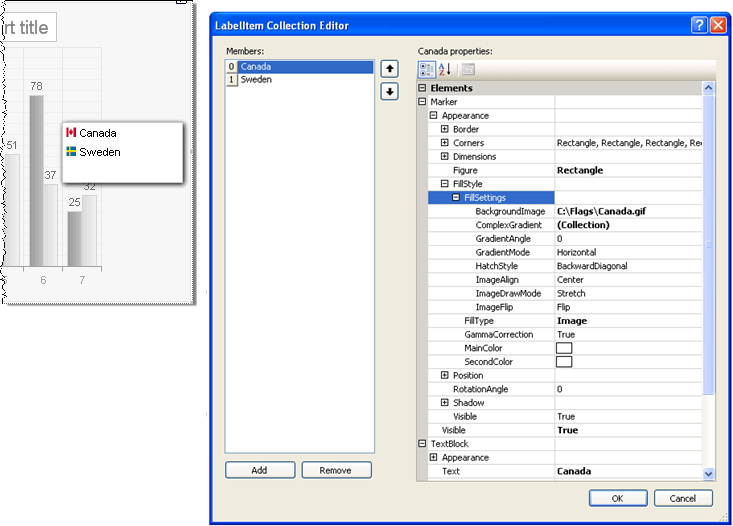 Use the ItemMarkerAppearance Figure property to select from a set of predefined marker shapes. 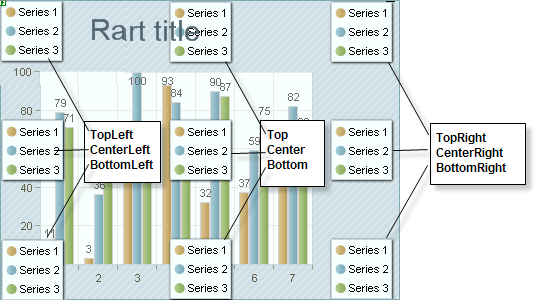 Use the Legend.Appearance.Position property to control where the legend should appear on the chart surface. The AlignedPosition sub property automatically places the legend in a predefined position. Or set the Auto property false and manually set the X properties to place the legend in any exact position. Use the Legend.Appearance.Dimensions property to control the legend height and width.By default the AutoSize sub property is true and dimensioning is handled for you.Set AutoSize off to manually handle Width, Height, Margins and Paddings. In the collection editor for the Legend Items property add one or more items. Use the Marker property to add images or colored shapes next to the text.Use the TextBlock property to add the text description for the legend item. You can also define image maps using the ActiveRegion property of the legend or legend items. To add images to the legend you can set the Marker.Appearance.FillStyle.FillType to Image and the Marker.Appearance.FillStyle.FillSettings.BackgroundImage to the path of an image to display.In the example below two legend items are added to the collection where the BackgroundImage contains image paths for two flags and where the TextBlock.Text properties contain corresponding descriptions. In addition the Legend.Appearance.Shadow property has Blur = 5 and Distance = 2.